Graffiti Magic provide solutions for graffiti removal and protection, they have a proven track record of projects where cost effective, simple graffiti protection has been provided to a wide range of surfaces. 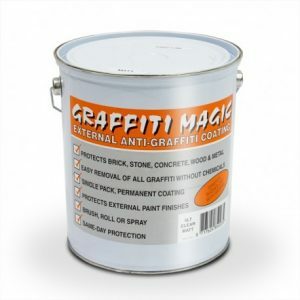 Graffiti magic now no longer supply from their UK office, but we offer alternatives to all of these ranges. Prior to them being discontinued we worked very closely with Graffiti Magic, so our team are well positioned to offer advice and alternatives. We have very similar products available that carry the same characteristics. Graffiti Removal & Protection Products. We have an extensive range of Anti-Graffiti products, and our team are experts in graffiti removal and also graffiti prevention. Our products have been used to great success in businesses and homes, as well as large public areas, like shopping centres, parks and playgrounds. Our products can handle both small scale problems and large industrial jobs. As well as this, our expert sales team are on hand to provide help and advice. No matter the size or scale of the problem Andrews can find a product to meet your needs. If you would like a spec using the equivalent to the Graffiti Magic range, or if you are interested in any of the products, then please contact us on 01902 429190. Alternatively, email us at info@andrewscoatings.co.uk.